A shocking and difficult Authentic Artist workshop for me last weekend. 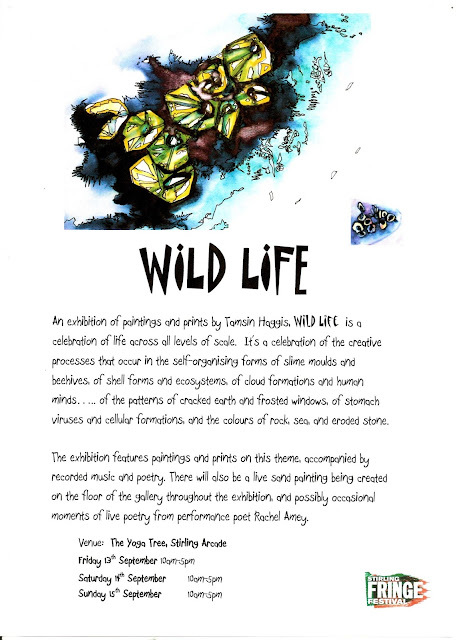 On the workshop I met a poet who told me about a book with the same name as my exhibition, Wild Life. Crawl up from the underworld. The one about having wings. and cast the old story behind you. Now firm in the daylight. The world is calling to you. Last night as I sat at the computer, I looked over at the front hallway and noticed that our local possum was quietly eating the cat's food. Then I noticed my cat about three feet away, totally unconcerned about sharing. As the possum left, the grey feral tomcat came up the stairs, the two of them passing politely while my cat watched. Then the feral calico cat stopped by and waited for the grey to finish. In the middle of the night, a couple of raccoons started fighting over the few remains. This morning as I did the dishes, I could see chickadees, a stellar jay, blackbirds and mourning doves eating the birdseed along with our grey squirrel and a pair of healthy rats, all side by side. Wild life has it's own etiquette. Darwin said something about how there weren't so much different animals as different degrees of animal. Last week was Moth Week, where up to three dozen moths would do their kamikaze circus around the full-spectrum lamp until they could give no more. In the morning there would be these beautiful carcasses on the floor that I'd give to the birds. Studying them with a magnifying glass revealed a spectacular and beautiful architecture that puts the Taj Mahal and Chartres to shame, even more so since Chartres doesn't have to fly and feed itself. WIld life is so unnecessarily beautiful.